The safe and reliable operation of technical systems is of great significance for the protection of human life and health, the environment, and of the vested economic value. The correct functioning of those systems has a profound impact also on production cost and product quality. The early detection of faults is critical in avoiding performance degradation and damage to the machinery or human life. Accurate diagnosis then helps to make the right decisions on emergency actions and repairs. Fault detection and diagnosis (FDD) has developed into a major area of research, at the intersection of systems and control engineering, artificial intelligence, applied mathematics and statistics, and such application fields as chemical, electrical, mechanical and aerospace engineering. IFAC has recognized the significance of FDD by launching a triennial symposium series dedicated to the subject. The SAFEPROCESS Symposium is organized every three years since the first symposium held in Baden-Baden in 1991. 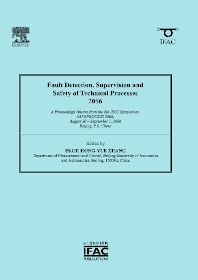 SAFEPROCESS 2006, the 6th IFAC Symposium on Fault Detection, Supervision and Safety of Technical Processes was held in Beijing, PR China. The program included three plenary papers, two semi-plenary papers, two industrial talks by internationally recognized experts and 258 regular papers, which have been selected out of a total of 387 regular and invited papers submitted.